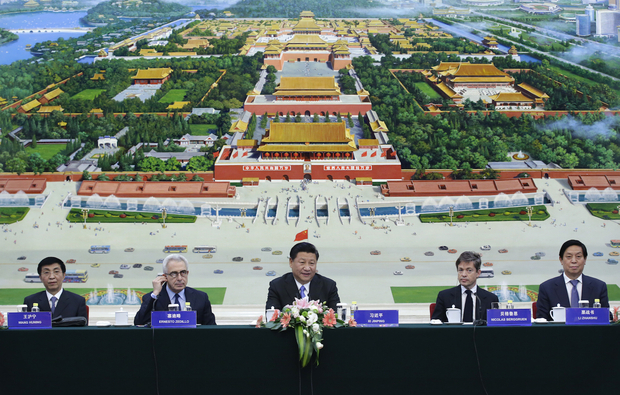 China's President Xi Jinping (C), Mexico's former President Ernesto Zedillo (2nd L) and Nicolas Berggruen (2nd R), Chairman of Nicolas Berggruen Institute, attend a meeting of the second Understanding China Conference on November 3, 2015 in Beijing, China. I worry that Xi Jinping is destabilizing China by concentrating so much power in his own hands. Why has he done it? Does it reflect a lack of trust in the competence of the other leaders, such as Li Keqiang? Perhaps. An urgency to accomplish certain programmatic reforms? Probably: He does have a reform program, although it turns out not to be the liberal kind of reform recommended by the West. Instead, he seems to want to give still more power to the big state owned enterprises, to use the courts more energetically to carry out political repression, to bring academics and creative artists to heel, to squeeze corruption out of the system and change the work style of the bureaucracy, and to fundamentally upgrade the way the military operates. These are reforms, even if we don’t like them. But they upset many vested interests and require a lot of political clout. What’s more, I think part of the motivation for what Xi is doing comes from his personality, which is self-confident, controlling, and impatient. He seems to perceive a society and a bureaucracy that are out of control, and he cannot bear to devolve responsibilities on others and wait for them to deliver. In doing all this, Xi is rolling back the institutional rules that Deng Xiaoping laboriously built into the system—collective leadership, a division of spheres of authority among top leaders, orderly cultivation of successors, timely retirement from office, and a degree of tolerance for social and intellectual diversity. By now he exercises more power than any Chinese leader in history. Mao Zedong could intervene in any policy area and his word was law, but he did not constantly micromanage across every policy area. Deng Xiaoping had the final word when he wanted it, but he tried to avoid daily policy, and before deciding on major issues he had to consult other senior leaders, such as Chen Yun. Jiang Zemin and Hu Jintao consulted widely with colleagues and retired elders, let senior colleagues manage major policy areas without interference, and tolerated substantial autonomy on the part of various bureaucratic organs. I fear that Xi is creating great danger for China. By undercutting the institutionalized system that Deng built, he hangs the survival of the regime on his ability to bear an enormous work load, make the right decisions, and not make big mistakes. He is trying to bottle up a growing diversity of social and intellectual forces that are bound to grow stronger. He may be breaking down, rather than building up, the consensus within the political leadership and among economic and intellectual elites over China’s path of development. He seems to have failed to cultivate the authority of anyone who can succeed him in office. As he departs from Deng Xiaoping’s path, he risks undermining the regime’s adaptability and resilience. In 2016, expect labor protests to be a potential flashpoint in China. In 2014, the number of labor protests doubled over the year before as China’s economic growth slowed. In 2015, that figure nearly doubled again, according to data from China Labor Bulletin, as growth dipped to its lowest rate in more than two decades. In 2016, China’s growth is expected to decelerate even further, which will crank up pressure on private and state-run enterprises, particularly industries such as coal, cement, and steel that have formed the backbone of China’s economy. Layoffs and unemployment in stagnating sectors mean that labor incidents may occur with even greater frequency in the upcoming year. A wave of labor disputes can pose a challenge in any society. But in China, mass incidents are imbued with political significance. The ruling Communist Party has long made economic growth a cornerstone of its legitimacy, forming a social pact with its citizenry—restricted political freedoms in exchange for prosperity. Expressions of group solidarity such as protests are tightly controlled, and those organized without government purview are often suppressed, sometimes violently. Yet as prosperity proves increasingly elusive as China’s economy slows and income inequality grows, authorities may view labor protests with greater suspicion—fearing that workers in desperate economic straits may become disillusioned with a social pact which no longer benefits them. Low unemployment has been a top priority in the Party’s efforts to maintain stability and prevent mass incidents; the official unemployment rate has remained around 4 percent for years as the economy galloped forwards, sometimes with double-digit growth. But now as the old economic model, based on state-led investment and exports, is running out of steam, while the transition to a services and innovation-based economy is underway but not guaranteed, millions of low-wage workers face an increasingly uncertain future. Factory closings mean that newly jobless migrant workers, many of whom have dedicated years of their lives to grueling work far away from family members, may become desperate. And organized labor may not necessarily step in to provide meaningful assistance. China’s only labor union, the All-China Federation of Trade Unions, is also the world’s largest with around 280 million members, according to state news agency Xinhua. As a state-controlled organization, however, the Federation has been criticized for seeming to emphasize stability and economic development, both major government goals, over the interests of the labor force. China’s booming services sector may ease the pain, providing growth opportunities and new jobs. But in the short term, Chinese authorities face a choice. Layoffs are a healthy if painful component of a market-based economy, just as demonstrations are a tense yet vital element in a healthy society. If Chinese authorities step in to prop up the job market to prevent unrest, this could derail China’s much-needed economic rebalancing. If authorities allow layoffs but suppress subsequent labor protests, pent-up frustration could boil over into a broader social or political crisis. That’s why I’ll be keeping a close eye on labor in 2016. The standard (and, in many ways, obviously correct) response to “what developments would be the most meaningful” is, of course, “it’s the economy, stupid.” Partially underlying this common response is the belief that the Party State’s political legitimacy—and, consequently, Chinese social stability—relies more on economic performance than on any other perceived measure. Scholars and journalists speak regularly of the imaginary social contract that the Party made with the Chinese population in the early 1990s: “we deliver rapid growth and higher living standards, and, in return, you acquiesce to our autocratic rule.” To much of the China-watching community, the existence and foundational importance of this contract is self-evident. Maybe so, but for how much longer? As economic growth has slowed in recent years, the Party leadership has aggressively sought to diversify its sources of political legitimacy. Recent examples range from the somewhat half-hearted attempt a few years ago to promote “happiness” as an alternative measure of social progress, to the ongoing campaign to mine “Chinese historical traditions” for usable ethical and philosophical content, to the continued tolerance—and occasional promotion—of the self-avowedly socialist and nationalist “New Left.” Currently on the political “table” are a wide range of proposals, including adopting a more egalitarian and redistributionist social agenda, developing local democracy and political accountability institutions, cultivating a form of cultural nationalism rooted in “Confucian” political ethics, or harvesting political support through aggressive foreign policy and the use of “geopolitical security” rhetoric (i.e., the “Putin option,” as it has been called in some circles). Conventional wisdom claims that these attempts are doomed to fail, that the Chinese public is too materialist and pragmatic—too jaded, perhaps, after the political turmoil of the 1960s and 70s—for them to matter. But why is this necessarily true? Such claims smack of the kind of intellectual oversight, if not outright hubris, that characterized “end of history” claims after the Soviet Collapse. Ideology and political culture continue to matter, especially in China, and they will likely help define—perhaps redefine—the nature of Chinese political legitimacy in the years to come. Moreover, they continue to evolve and change at occasionally breakneck speeds: A mainstream Chinese intellectual from 2005, if he or she were transported to the present day via a wormhole, would likely be shocked at the rapid rise of both the “New Left” and Neo-Confucianism after 2008-09. The past two or three years have arguably produced more ideological conflict and discussion among Chinese intellectual and policy circles than any period after the later 1980s, and one gets the feeling that the next few years will see the tension reach some sort of breaking point. China watchers ignore these ideological wars at their own risk. I agree with each of the three writers in seeing an increasingly tense domestic situation gradually brewing in China. Here I only want to suggest that the South China Sea situation is likely to become even more dangerous than it has been to date. Thus far, the United States has exercised military gestures to challenge China’s sweeping but vague international law rhetoric and its swift transformation of reefs into strategically valuable artificial islands. Those gestures have proved as ineffectual as they have been imprecise in their legal implications. Too little attention is being given to the possibilities of invoking the assistance of international institutions for peacefully arbitrating and adjudicating the array of complex, conflicting claims involved. Only the Philippines, unable to defend itself by other means, has resorted to United Nations Convention on the Law Of the Sea (UNCLOS) arbitration, which has stunned China and tested its respect for UNCLOS commitments that the P.R.C. helped shape and freely ratified. The arbitral tribunal of independent, impartial experts is expected to render its decision next May or June, and that decision, if it rejects some of Beijing’s claims, may actually add to existing tensions, especially if Beijing continues to thumb its nose at its UNCLOS obligations. Another evolving wild card is the position of Taiwan, which is caught between its respect for American preferences and the law of the sea rules of an UNCLOS system to which it is not allowed to adhere, on the one hand, and the desire of the outgoing KMT government to perpetuate the claims of the Chinese state and avoid offending Beijing, on the other. The most immediate challenge confronting the anticipated new Democratic Progressive Party government of Tsai Ing-wen will be how to resolve this tension. My hope is that Taiwan will turn its occupation of Taiping Island, by far the largest of the contested Spratly features, into a model for peaceful cooperation with its neighbors that will embarrass Beijing into converting its artificial islands to similarly peaceful cooperation with its neighbors. But don’t hold your breath! What should China watchers be watching most closely in 2016? When all else has appeared gloomy in contemporary China, the economy has always been the one place where we could look for optimism and hope. Yet the overall picture for the economy and economic policy in 2016 looks as hazy as Beijing’s air. The full 13th Five-Year Plan will be issued in March. A genuinely reformist plan would highlight productivity, conservation, and innovation targets, and be rooted in policies requiring thorough-going liberalization (particularly in services) on a short timeline. At the same time, more stimulus is certainly coming. Will it be high-calorie, low-nutrition funds for old-school infrastructure, or a dramatic expansion of rural and urban healthcare coverage and other elements of the social safety net? If growth does not pick up soon, pressure for further RMB depreciation will mount and be economically justified, not to promote exports but to forestall further capital flight. More rate increases by the United States Federal Reserve would only intensify such pressure. The key question at that point would be whether Beijing would, in an act of true courage, pull the peg to the U.S. dollar altogether and allow the RMB to naturally find its equilibrium rate, or whether it would enact a one-time re-set to a lower rate. Neither step would bring much praise, but the latter approach would create an international firestorm. 2016 is China’s G-20 year, which will culminate in the Hangzhou summit in early September. Beijing could use the opportunity to promote inclusive growth, reduced barriers to trade and investment, and greater macroeconomic policy transparency and coordination. A more conservative approach would be to press for a global wave of infrastructure spending and greater coordination by G20 governments to limit the instability and volatility of financial and energy markets. Which will worry Xi, who is a believer. If he truly wants to take Taiwan back, these next few years represent his best chance. He might try to take it. Expect all of these predictions to be overshadowed, by something bizarre and unpredictable—like a born-again Christian leading a rebellion against Xi and establishing a new heavenly kingdom. There will be more dragons too.